Recently NZDUSD has been very volatile. 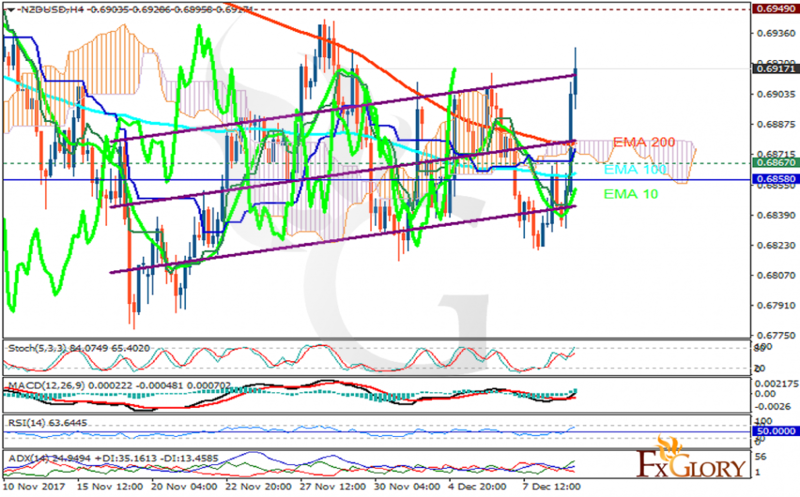 The support rests at 0.68670 with resistance at 0.69490 which both lines are above the weekly pivot point at 0.68580. The EMA of 10 is moving with bullish bias in the ascendant channel but it is below the EMA of 200 and the EMA of 100. The RSI is rising towards the overbought area, the MACD line is above the signal line in the positive territory and the Stochastic is showing upward momentum. The ADX is showing buy signal. The price is above the Ichimoku Cloud and the Chinkou Span. The Tenkan-sen and the Kijun-sen are both showing an upward trend. Long positions are recommended towards the resistance area but after reaching this point, sellers can enjoy the market.